Intastop products are incredibly reliable and we have chosen them for many projects across our Fairfield site including wall and door protection,” said Steven Johnson Building Estates Officer Northern Care Alliance NHS Group. 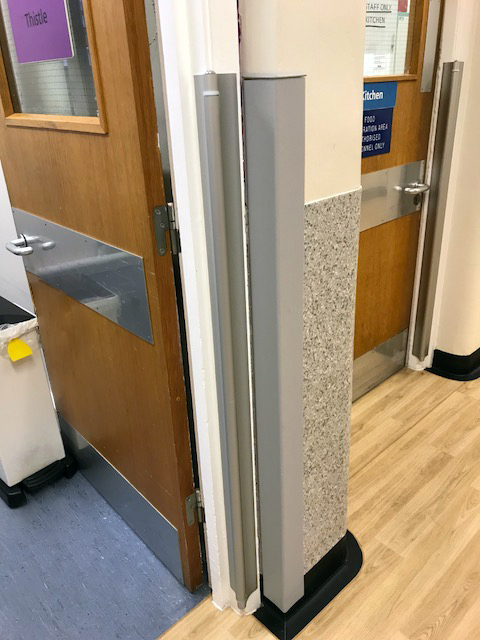 “On this occasion, after a trial, we chose the corner protection products after a trial of the aluminium roller guards on our RESUS room where the door frames have been particularly badly damaged due to the angle of access from the corridor and the speed at which this was carried out in an emergency. The Northern Care Alliance NHS Group, which serves the Bury and Rochdale area, were experiencing a high level of damage of its fire doors during the movement of beds, posing a safety risk at its Fairfield General Hospital. The Trust therefore took additional steps to boost its maintenance programme in critical areas by instigating a frame protection programme. Intastop Ltd was chosen to deliver frame guards along with wall protection to help the Trust meet the demands of its high traffic areas. The Rotary Frame Guards specified are designed to protect door frames and exposed corners and are impact tested to 550kg at 2mph giving more than adequate protection. With a patented rotating drum that helps to deflect traffic away from the wall corner or frame the frame guard is ideally suited to high traffic areas where the probability of daily impact and damage is high. Impact tested up to 550kg at 2mph. Reduces maintenance costs by deflecting traffic from vulnerable areas. Removes the need to constantly repair frames.